The Cornish village of Boscastle is to get £1.5m, including Objective One money, to help its regeneration. 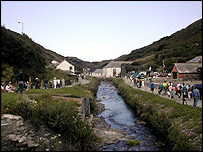 The bid for the money was led by the Boscastle Regeneration Steering Group, set up by North Cornwall District Council after August 2004's flood. The council said the cash would be used to improve services and facilities, to make the area more attractive and help support the local economy. It will help build a new village trail, a visitor centre and improve parking. This will be match-funded by the main agencies involved to deliver a package of projects worth £1,473,100. Boscastle ward councillor Janey Comber: "This regeneration scheme is not simply about reinstating what was lost in the flood. It is about improving facilities and enhancing the village to boost the local economy and make Boscastle even more attractive for everyone." Carleen Kelemen, director of the Objective One Partnership, said: ¿This project will help to rebuild and improve an historic Cornish village where the residents survived a terrible natural disaster. More than 100 people were rescued on the 16 August 2004 when a 3m (10ft) wall of water crashed through Boscastle.